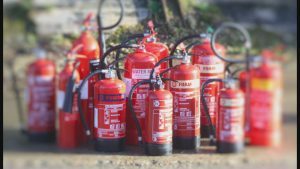 Online training with hands fire extinguisher training! One of our client wanted online fire training and practical extinguisher training! Our customer loves to be able to complete staff fire training in less busy periods. So our online training solution was ideal for staff. However, our client also wanted staff to tackle real fires with fire extinguishers! So we have offered discounted practical training for every client who buys tailored or bespoke online fire training. Our online training options are general training, tailored training and also bespoke packages. So what does this mean? General training are our web based standard training courses for clients needing just one or two persons trained. There are four courses to pick from. Tailored training is an online training website just for your staff! We take our standard fire training courses and then add two more lessons. We add your fire emergency plan and also your fire evacuation plan too. Bespoke packages is where we film new videos, take new pictures and also add new notes, to all lessons. These videos will be shot at your workplace, so will help your staff to understand procedures, plans and look for fire risks. Not as much as you would think! Our tailored online training websites are from just £500+vat to train up to 50 persons. If new staff join or are promoted to fire marshal they can simple do a course. For workplaces with more than 100 persons our fees are just £1000+vat. We also have special offers for companies that want fire risk assessment, online training and our other services. So do contact us for more details. You can either call or email us now!